These films are made from a lightweight aerospace material. They have a fire resistant, pressure sensitive adhesive which meets or exceeds the FAA 12-second vertical burn requirement. The peel strength is about 10 #/inch when pulled at 180 degrees. These films are easy to install and remove. They are also easy to repair since the film adheres to itself. They are extremely versatile because they can easily be cut and formed. IMPORTANT! Other companies have tried to duplicate this product. 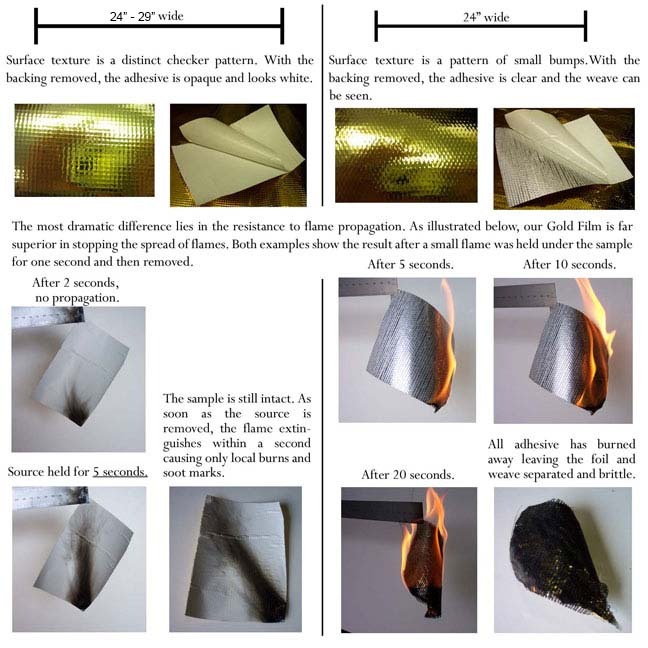 To be sure you get the genuine product, look for a film that is 24”-29” wide and has a white, fire resistant adhesive instead of a clear flammable adhesive. Retail price is $30.00 USD per linear foot. Provides radiant heat protection up to 1050°F (and higher for short durations). Film is 28” wide, 14 mil thick (0.014 inches), and weighs about 12 oz/yd². Retail price is $25.00 USD per linear foot. Retail price is $13.00 USD per linear foot. This is an ultra thin film that is less than 3 mils thick. The standard width is about 19 inches and weighs about 2 oz/yd². This film currently comes in gold or silver. Retail price is $13.50 USD per linear foot. Provides radiant heat protection up to 1050°F.